After a few setbacks due to recent back surgery and the resulting handicap, I am so excited to announce that I just approved the final copy of my second novel, A Debt to the Devil! It should be available on Amazon next week at the latest!!! An official release will come shortly. Liz Andrews Ericson is an intelligent, hard-working entrepreneur with a big heart and trusting nature, especially when it comes to her husband, Matthew Ericson. After struggling with childhood obesity and finally losing fifty pounds in her senior year of high school, Liz falls deeply in love with Matthew, a handsome and charismatic Texan. By the third year of marriage, Liz hears whispers and suggestions of her husband’s infidelities but is unable to see through his expert manipulation—until the day she’s presented with undeniable proof. 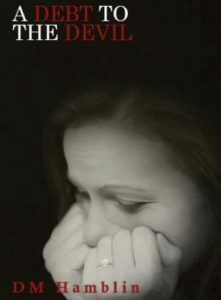 A Debt to the Devil is a romantic thriller with multiple twists and turns throughout Liz Ericson’s life, from the emotional damage caused by being an overweight adolescent to her efforts to free herself from her sociopathic husband.